WOODBURY Tn. 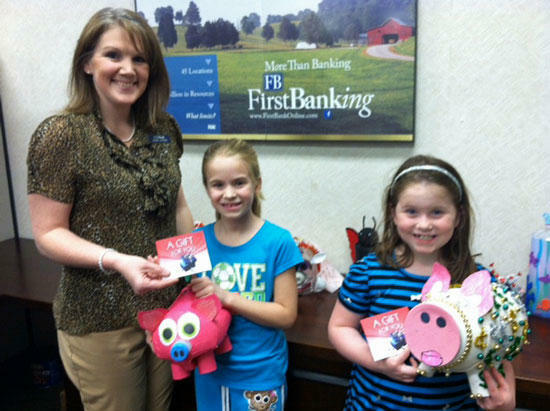 - FirstBank congratulates State Piggy Bank Pageant winners, Julie Bush and Dana Nixon. This is a local event presented by the UT Extension agency during Tennessee Saves Week. FirstBank is proud to have partnered with this program and provided the awards for the 1st place winners. FirstBank is the third largest Tennessee-based bank, with 54 locations across the Southeast. The bank, headquartered in Lexington, Tenn., serves every major metropolitan market in the state and, with more than $2 billion in total assets, has the resources to provide a comprehensive variety of financial services and products. FirstBank follows a community-banking model which began when the charter was issued in 1906 as Farmers State Bank, in Scotts Hill, Tenn. As Tennessee's premier community bank, FirstBank is committed to its role as a leader in the communities it serves. That commitment is reflected by the Ayers Foundation Scholars program, a scholarship fund established by FirstBank Chairman and sole shareholder James W. Ayers to advance higher education for young people in Tennessee.